I noticed the coir lining around my hanging basket beginning to thin in places so I became more attentive for several days to discover the cause. Patience paid off and one day I saw the culprit. A bird. At first glance at the color of the tail, I wondered if this was a warbler. I waited for the bird to slowly work its way around the rim of the container. What appeared was not a warbler at all, but a female orchard oriole (Icterus spurius). I sent photographs to serious birders in three states just to make sure and it was confirmed as a female orchard oriole. We watched her return several times to gather the coir fibers around this hanging basket. She must be building her nest close by. Female orioles build the bulk of their hanging nest of woven grasses and long plant fibers and twigs. She will finish it off with soft plant down and fine grasses as a lining. We have seen Mr. Oriole near the suet once but only fleetingly and he hasn’t been back. Maybe I’ll be lucky enough to spot their distinct nest on a walk through the neighborhood in the next weeks. Fingers crossed…. Our pair will finish raising their brood and could migrate south as early as mid to late July. For a little more information on this climate threatened oriole, click HERE. It’s bird migration time and things are happening in our little spit of land. According to Chris Bosak, Birds of New England, Labor Day weekend was a good time to fill the feeders again for the fall and winter birds. So I filled the feeder with hulled black oil sunflower seeds and the welcome mat was officially rolled out for the migratory songbirds. Due to an invasion of breeding house sparrows this summer, I fed only the insect eaters, the robins, bluebirds, phoebes, and chipping sparrows nibbling on what fell beneath the feeder… no seeds at all, just meal worms. Those pesky house sparrows turned their noses up at the meal worms and have exited the neighborhood, probably living inside Home Depot or around McDonalds for the winter. We are ready for the next wave! Our first winter visitors arrived two mornings ago. The white-throated sparrow and their snowbird companions, the dark-eyed junco, are perhaps the best harbinger of winter. They arrived overnight and I spotted the newcomers at dawn cleaning up fallen seeds beneath the feeder. The junco is a fairly nondescript bird, gray above and a white belly. The female is generally paler with a mixture of brown in the plumage. Our flock should number 20 or more by the end of October. Juncos are among my favorite little birds because they entertain me with their antics all winter. Their scientific name is hyemalis, Latin for ‘winter,’ an appropriate name for no snowstorm, blizzard, or arctic day can keep them away. Their feisty interactions competing for seed under the feeder (and on the feeder) make me smile. They run, they hop, they flit, and they scratch as they battle each other for seed on the frozen ground or snow. Look for them to appear beneath your feeder around here very soon. I have never met a gardener who didn’t like birds. Some are passionate bird lovers and other gardeners feed them or simply enjoy seeing them in the gardens. Birds bring color and life into your gardens and are interesting animals to study. With bird habitat vanishing and weather patterns changing, it is vital that we collect data to track the health of bird populations and identify trends for conservation. 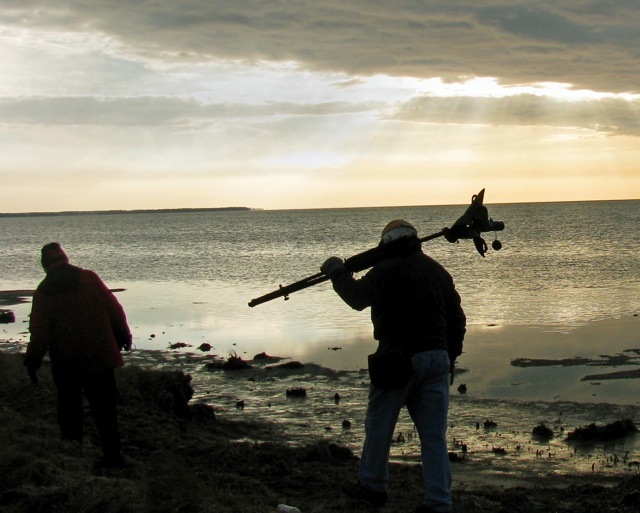 Time is drawing near for the largest and longest-running wildlife survey that exists, the Christmas Bird Count or CBC. The Christmas season marks this exciting time for birders as they brave the winter elements for one full day as citizen scientists. 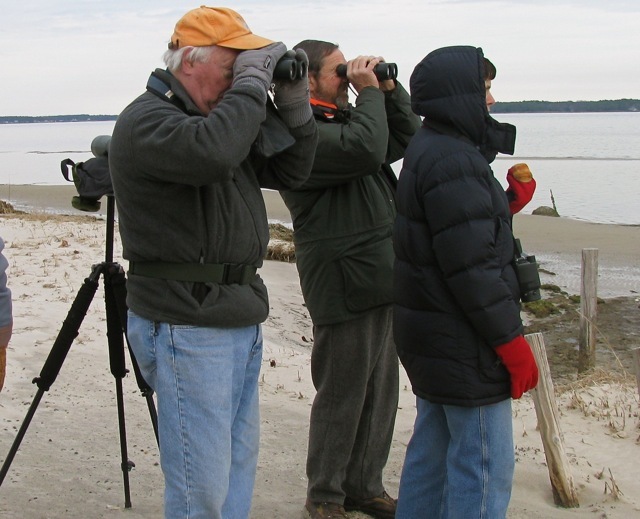 The CBC is a program of the National Audubon Society, where over 55,000 volunteers are up at the crack of dawn to count all the birds they can identify by sight or sound in a 15-mile diameter in one day. The count that runs from December 14 through January 5, collects data on all birds seen in each circle and is compiled and used to track the health of bird populations. Folks do not have to be die hard birders to take part in the count. Less experienced counters are paired with experienced birders who head up each field team. All that volunteers need is to bundle up with warm, waterproof clothes and boots, birding binoculars and/or a spotting scope, a good field guide, and a few snacks and water. 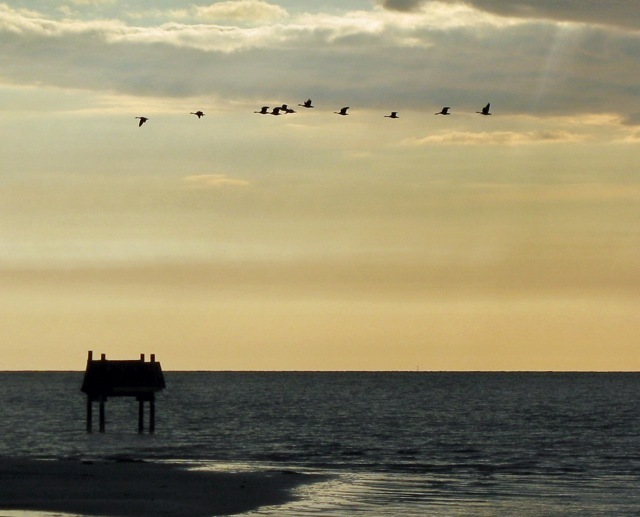 The Chesapeake Bay area is rich in bird life and several groups count in this area. Much of our group’s time is spent on the beachfront identifying and counting waterfowl and shorebirds on and over the water. Starting out on the banks of the Ware River where estimates of waterfowl are recorded, we slowly work our way around the peninsula to the North River, then we move toward the interior of our circle through wooded areas, back yards and across fields. At dusk, when all is finished, we gather to complete our data and raise a glass of cheer to another successful count. Wintertime is a great time to watch birds. The leaves are off the trees making the birds more visible to bird watchers. And, of course, there are some birds that are visitors only in the winter. More Yuletide volunteers are needed for the CBC. To find out about the count in your area visit the National Audubon Society website. To see count data, visit Bird Source, a joint project of the National Audubon Society and the Cornell Labrotory of Ornithology. Check it out!